NeuroCore has been formulated with key ingredients such as beta-alanine, L-citrulline, creatine hydrochloride and Geranium robertianum to deliver a superior training experience unlike anything available on the market today. With 330mg of pure caffeine anhydrous, and a patent-pending, naturally sourced 531mg dose of geranium extract, which includes a greater active dose than leading competitors, Neurocore quickly delivers a surge of energy to give you powerful and enhanced workout performance. Within moments of your first dose, Neurocore stimulates the acute mental focus necessary for an unstoppable training experienceo. Neurocore delivers a 3000mg dose of creatine hydrochloride (HCl), patented for its improved solubility. Added at a clinically suggested amount, expect to increase muscular strength for bigger lifts. NeuroCore is formulated with 3000mg of L-citrulline, which has actually been suggested in research to reach superior peak plasma arginine levels compared to a larger dose of L-arginine. What can I expect to feel on Neurocore? 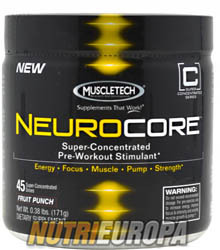 Neurocore is a super-concentrated pre-workout performance-enhancing stimulant formulated to deliver intense energy, mental focus, increased muscle and strength and awesome muscle pumps for an outstanding training experience. Why does Neurocore come with a guarantee? Because that's how confident we are that you're going to love new Neurocore. Every dose delivers the exact amount of active dose scientifically suggested to deliver energy, focus, increased muscle and strength. 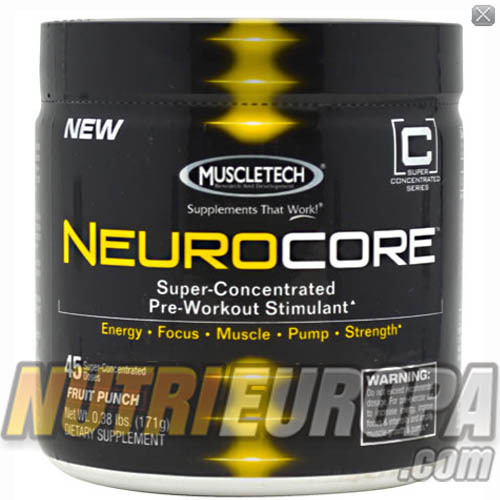 Can I stack Neurocore with other stimulants? Absolutely not. Neurocore is an extremely powerful performance-enhancing stimulant and should never be taken with any other stimulant-based products. Natural And Artificial Flavors, Sucralose, Elderberry Powder, Acesulfame-Potassium. Directions: Shake container thoroughly before use. Consume 30-45 minutes before activity. We strongly recommend assessing your tolerance by using 1 rounded scoop mixed in 4 oz. of water, especially if you're sensitive to stimulants. Increase to 2 rounded scoops mixed in 8 oz. of water. For full effects, increase to 3 rounded scoops mixed in 12 oz. of water. Do not exceed 3 scoops in a 24-hour period. Drink 8-10 glasses of water daily for general good health. Read the entire label before use. Warnings: NNot intended for use by persons under 18. Do not use if pregnant or nursing. Discontinue use and consult a medical doctor if you experience unusual symptoms. Consult a medical doctor before use if you have been treated for, or diagnosed with, or have a family history of any medical condition including (but not limited to) high blood pressure or heart problems, or are contemplating becoming pregnant, or if you are using any prescription or over-the-counter drug(s), including blood thinners. One serving of this product contains up to as much caffeine as 1 cup of coffee. Caffeine sensitive individuals may experience the following symptoms including (but not limited to) reslessness, nervousness, tremors, headache, anxiety, palpitations, increased heart rate, or difficulty sleeping. Do not combine with other sources of caffeine or stimulants. Do not take while fasting. Do not use for more than 6 months. Consult a medical doctor before starting any diet or exercise program. Do not exceed recommended serving. Improper use of this product will not improve results and is not advised. Use only as directed. Do not use if packaging has been tampered with. Store in a cool, dry place (60°F to 80°F). KEEP OUT OF REACH OF CHILDREN. MuscleTech, IOVATE HEALTH SCIENCE INC., New York, (U.S.A).